On the way to church in Boşcana. 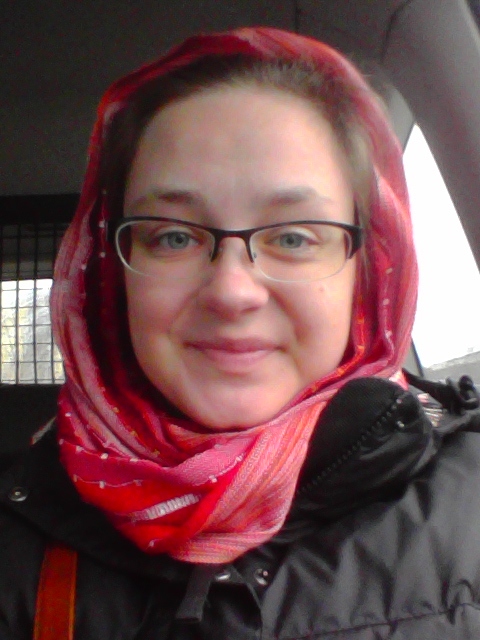 Churches here are almost 100% Eastern or Russian Orthodox, and women are required to cover their hair with a scarf. Took a little trip with my host mom. We visited my host sister and her husband at my host sister’s mother-in-law’s house in Boşcana, slightly north of Chişinău. It was a nice visit and then the following morning we went to church then visited my host aunt and her family that live nearby. Everyone was welcoming to the “American” and I had a good time. Observed a couple of “Open Lessons”. 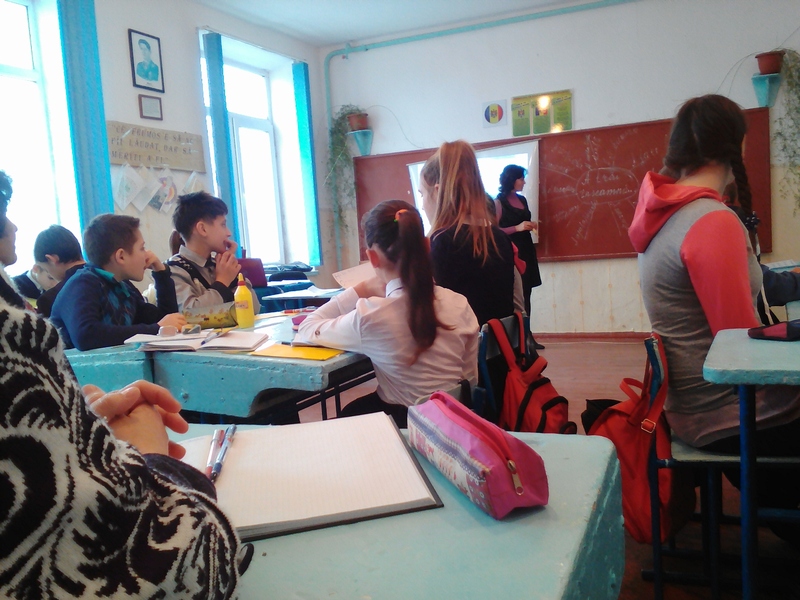 Here in Moldova, every year teachers have to have “open lessons” where other teachers and administrators observe their lessons. 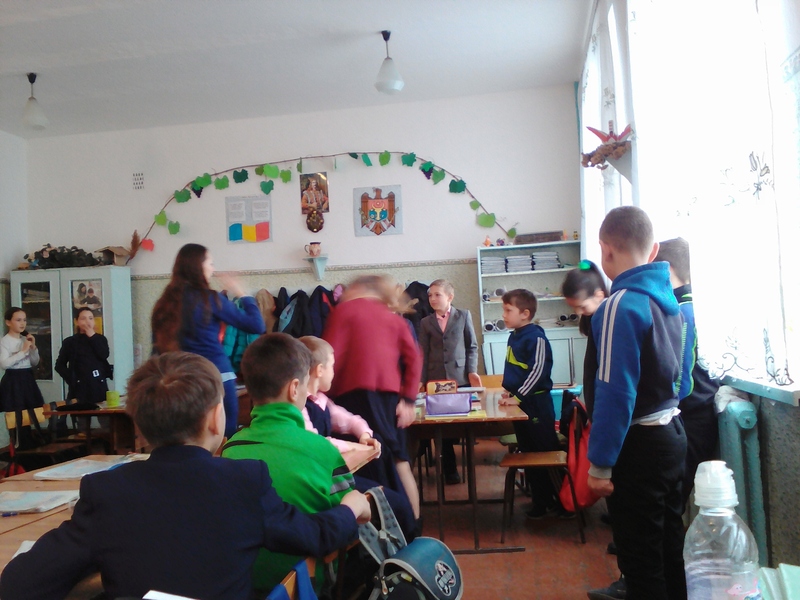 I observed a homeroom class where they discussed the Holocaust and a Romanian lesson. Taught an “Open Lesson”. My partner teacher and I taught our first open lesson together last week. It went pretty well, but I dislike that you are expected to essentially put on a performance. Visited our raion center. Moldova is divided into different districts called ‘raions’. Each raion has a town that is called the center. I usually compare the raion center to a county seat, but they’re a bit more important. The raion center usually is the biggest town in the raion and you can find larger grocery stores, banks, hospitals, and high schools there. My host mom and I went in the hopes of getting my boots fixed (they need new heels) but the cobbler was closed. It was a very, very cold day- I thought I might get frostbite! Thankfully, I escaped with just a bit of windburn. Started an English Club! 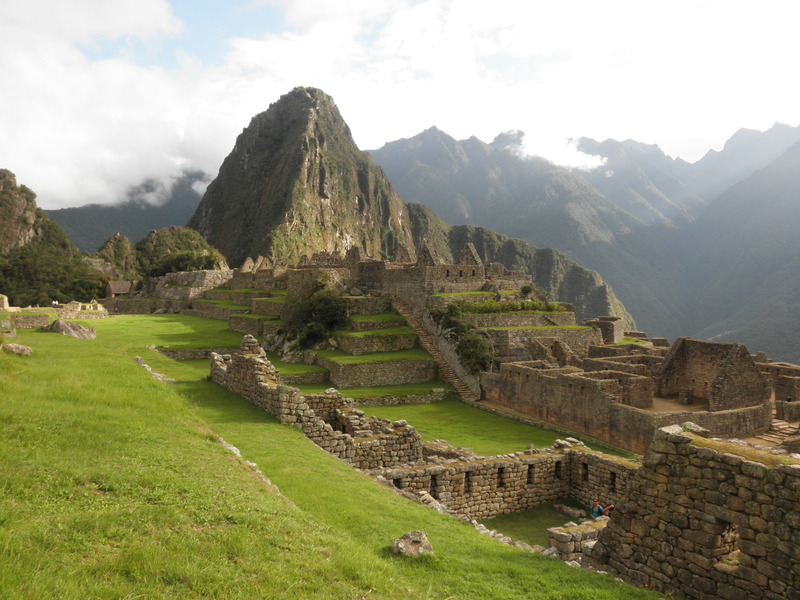 I began an after-school English Club with students in grades 7, 8, and 9. I had so much interest, I’ve had to split the students into three different (mixed grade-level) groups that meet three days after school. I have about 40 students come each week, and we’ve had fun learning conversational English and about American culture, traditions, and life. This week we learned about greetings and the importance of handshakes in American culture (see the video above that we made for Peace Corps Week). Here in Moldova, only men generally greet each other with a handshake, so we practiced doing firm handshakes with everyone. Attended various school activities. We had a small concert to celebrate Grigore Vieru, a prominent Moldovan poet, on his birthday. We also held “Feşteliţa are talent” (Feşteliţa Has Talent) with the students. Students could perform poems, dance, sing, or play instruments. The three top winners will go on to “Ştefan Vodă are talent” (Ştefan Vodă Has Talent; Ştefan Vodă is our raion center). 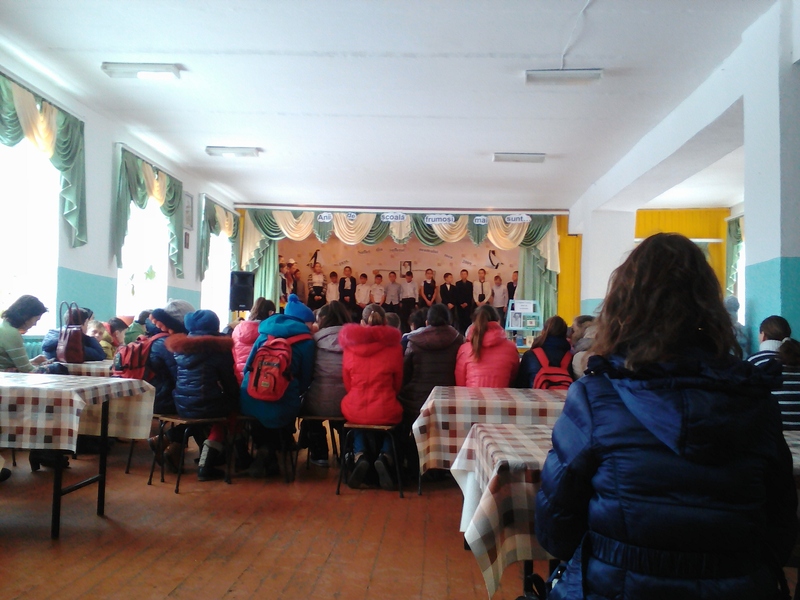 The winners were a 9th grade girl who recited a poem, a 9th grade boy who played the pan flute, and a 2nd grade girl who sang a traditional Moldovan song. Went to Chişinău for a Language Training. Peace Corps had a mandatory Romanian training for English and Health Education volunteers. We spent the weekend in the capital and worked on improving our Romanian as well as learning about spring in Moldova. Celebrated Peace Corps Week. To celebrate Peace Corps week, celebrated worldwide, I skyped with my mom’s 5th grade students in the United States and participated in a large event celebrating both Peace Corps Week and International Women’s Month in Căuşeni, a nearby town. 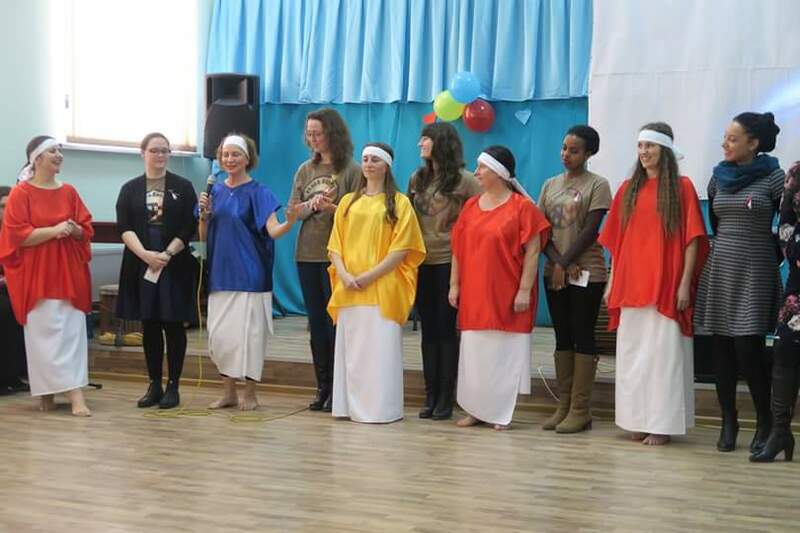 Fellow PCV Anne did an amazing time putting together the celebration, complete with awards, American, Moldovan, and African dance, African drummers, Moldovan theater, and poetry. Some highlights were: a group of mothers in Căuşeni learned and performed African dances, volunteers shared about their work in Moldova, children that are a part of a “Dance and English” group performed a dance and sang in English, and the recitation of “Phenomenal Woman” by Maya Angelou by both Moldovan women (speaking in English) and American female volunteers (speaking in Romanian). English Education Volunteer gathering in Ialoveni. 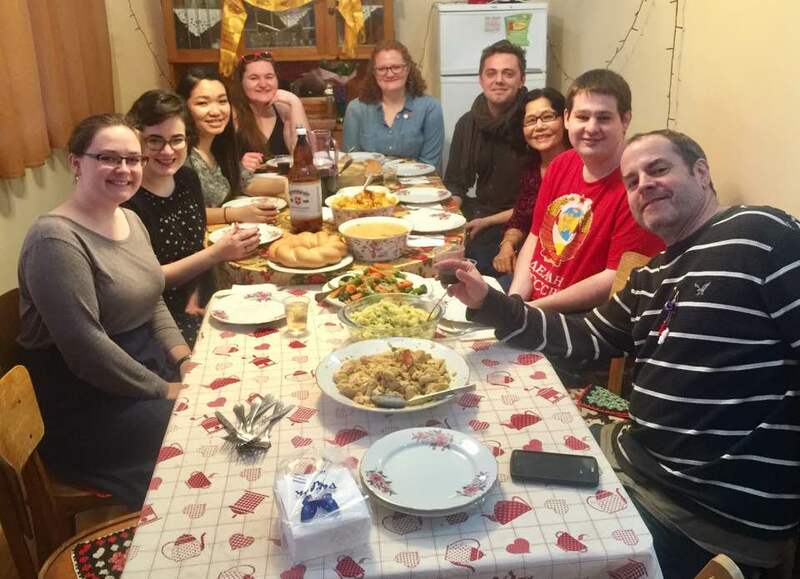 David and Champa, fellow Peace Corps volunteers, hosted our English Education group for a Nepali dinner at their place in Ialoveni Raion. The food was delicious, dessert amazing (brownies, apple pie, and pound cake!! ), and we enjoyed getting together. It’s been a busy couple of months and the coming months will be busy as well, as the school year comes to a close and we welcome the new group of volunteers (I’ll be one of the mentors, so I’ll be pretty busy with that!). Previous Article Happy Women’s Day!